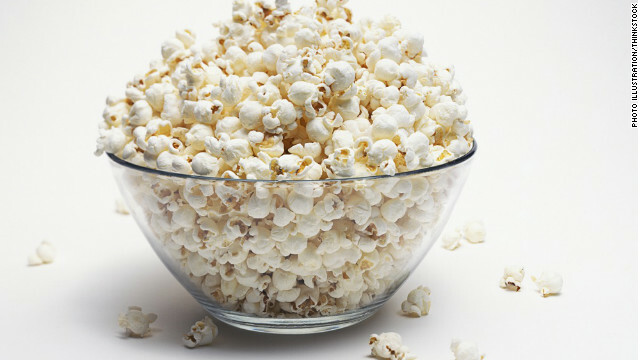 Popcorn isn't just low in calories and high in fiber. Turns out the popular snack is chock full of antioxidants, too. Vinson and his colleagues analyzed four brands of commercially available popcorn. After grinding kernels (both popped and unpopped) into a fine powder, they separated out the polyphenols by adding a pair of solvents - a process that roughly mimics what happens in the stomach as food is digested, Vinson says. A single serving of popcorn - about two tablespoons of unpopped kernels - contained up to 300 milligrams of polyphenols, the researchers found. By contrast, the average polyphenol content of fruit is about 160 milligrams per serving, while a single serving of sweet corn contains 114 milligrams. Some types of polyphenols are pigments, and in fruit the biggest concentrations tend to be found in the skin and seeds. Similarly, the hull or outer skin of the corn kernel - the stuff that gets stuck in your teeth when you're munching away - was the richest polyphenol source. "That's where the antioxidants are, that's where the fiber is," Vinson says. "You shouldn't throw that out." The findings don't mean that popcorn should replace apples and oranges in your diet, of course. "Popcorn is no substitute for fruit," says Michael G. Coco, an undergraduate chemistry student at the university who participated in the study. "Fruits have other vitamins and minerals that popcorn does not contain." But popcorn isn't always healthy, Brown adds. Movie-theater popcorn drenched in butter is the opposite of a health food, she says, and some microwave and pre-popped varieties contain artificial or less-than-healthy ingredients - such as partially hydrogenated oils - that shoppers should be mindful of. "Not all popcorn is created equal, and you can get some nasty stuff in there, especially with the microwave popcorn." « Previous entryWould you get the care Muamba did? This story fails to point out that the study was partially funded by the Weaver Popcorn Company. Source: WebMD. In other words, this study may be considered a media product placement, not serious research. And yet popcorn is packed with anitoxidents. What in our media isn't product placement these days...Our government has been over run by big business and most people just wake up every single day to go and be support zombies to the same mega corporations that have been poisoning us and destroying our planet for centuries. Yet we continue to contribute to the downward spiral, complain about it and do nothing to change anything since that might be uncomfortable. Almost makes me hope that the Mayan calendar is right. Why? Measuring how many milligrams of polyphenols any given food contains is a straightforward measurement that is easy both to obtain and to duplicate. Are you seriously suggesting that they bodged the measurements, or didn't do them at all? Criticizing the source of funding is no criticism at all; if you want to challenge the results, challenge the facts. SixDegrees, I think the thing that we're forgetting here is probably bio-availability. The study ground kernels down into a fine powder which is probably the most likely way to absorb it. When was the last time you used your teeth to grind a corn hull into a fine powder before swallowing it. As it stands, if most of the anti-oxidants are in the hull then they are getting excreted pretty much intact in our feces unless we develop a way to digest corn hulls. Oh YES!!! Yummy antioxidants. You will need them ALL and then some to combat the bt bacteria that comes with your grain! Yes, I'm sure the next study will prove that none of this is true and that popcorn is actually a carcinogen. Idiot. I see the validity of this is being question, but for popcorn lovers, Quinn Popcorn has taken All the chemicals and additives out of their microwave popcorn and the popping bag. They ditched the plastic and hydrogenated oils and replaced them with a compostable paper and pure all natural ingredients. The kernels are organic, verified through the Non-GMO Project, as are the expeller pressed oils. You might want to try it! I guess I'll have some popcorn to celebrate! I have been eating stove top popcorn for over 30 years,best snack out there. What about the toxins released with microwave linked to blood cancer? Well, you don't have to a) eat microwave popcorn or b) stick your face over the bag breathing in the aerosolized compounds in question. Real popcorn isn't made in a microwave. It is SOOO much better made the old fashioned way and tastes a whole lot better. Come on America get off your lazy A$$ and stop opting for the easy way for everything. JR – Your response to the comment has me just laughing so hard..... thank you for making me laugh at the end of my day. Just way to funny!!! This is a Weaver Popcorn Company sponsered study. Any company can make research seem to favor their product. It's easy. Then please explain how the results in this study are incorrect from a scientific standpoint. Are you saying that the measurements presented are wrong? If so, why are they wrong, and what should they actually be? That's assuming antioxidants are actually good for you, which is certainly not an agreed-upon fact amongst biologists. Also, I highly doubt antioxidants are bioavailable in the hull. Sure, artificially grinding them up might liberate the polyphenols, but in reality they will remain trapped in the hull and exit via feces. This is absolute BS, and is about as logical as eating bacon and expecting to lower your cholesterol. Please have at least one scientist validate the report before publishing it. How pathetic. And how can a solvent roughly simulate the stomach environment? Solvents are more lipophilic, whereas the stomach fluid is aqueous? This is really not scientific at all. Great news! 🙂 I love popcorn, I agree with the comments above though, and it is certain that a bunch of salt or the dehydrated processed cheese is not good, it is also pretty low in calories which is a bonus, if you ate a half bag of the trader joes organic olive oil variety you would be eating a ThinDish for sure, definitely less than 600 cal. If you're into a healthy topping for your popcorn, try nutritional yeast. Lots of B vitamins and iron and a nice cheesy flavor. Seriously? Yeast? Cheesy flavor? Being an avid homebrewer I can scientifically state that yeast does NOT taste like cheese...no way, no how. Yeesh....that's over-reaching just a little bit. Actually, Nutritional Yeast is different than Brewers Yeast. Annie is right, it would give a nice cheesy flavor. Brewers Yeast, definitely would not. Late girlfriend used some magic blend of yeast and tamari. It was awesome. For my saucepan / canola oil popcorn, I sometimes sprinkle paprika on it. Pretty good too. Oh, and let's not forget to thank North America's Indians for inventing corn. Thanks! I wonder which juice company will create the new super juice made from popcorn. well if this was a weaver sponsored study, so be it. the sad fact is that what this always boils down to is money. who else is going to pay for a study like this if not a popcorn company?? so frankly, i don't mind that it was "sponsored" by them. if you really want to know if the study has merit, read the details and fine print on how it was done, instead of poo pooing it right off the bat. i personally would love to see the study design!!! quit your whining about this study people. all you have to do to get the antioxidants is put the popcorn in your coffee grinder and turn it into a powder before you pop it. duh! How long before we see a popcorn supplement on the health-food shelves? What planet is this writer on? You don't "fuss up" popcorn with wierd toppings just to avoid salt and butter. The whole point of popcorn is comfort and enjoyment – popcorn is an inexpensive snack that fills you up and tastes wonderful and best with butter and salt. An all natural food with all natural traditional ingredients. I am sick and tired of all the diet promoters taking every single regular normal whole food prepared normal ways that people have been eating for decades prepared with plain and simple ingredients, calling it "bad" because it has any fat and salt in it, and then trying to make people think if they take all the fat out, put in non-traditional, non-normal seasonings and cook it non-normal ways that now somehow that food is more "health." What nonsense. I know, right? Feel free to dump on the salt and butter with your meat and potatoes too. And gravy. What could possibly go wrong? Mmmmmm....GMO corn soaked in Atrazine (Round-up). Gives popcorn that special flavor. Regardless of any of that, what it will do is spike your blood sugar and trigger your insulin response. You should stay away from foods that do this as much as possible. Corn is a grain in any form and grains are not good for humans, period. Your blood sugar is going to rise after you eat pretty much all the time. If you eat popcorn, or any grain, in moderation, you'll be okay, particularly if you pair it with protein to regulate your sugars. Diabetics should avoid it, of course, just like they should avoid many foods that non-diabetics can eat with no problem, but someone with a functioning pancreas will be fine. Don't claim that grains are the devil when we have a huge list of cultures that subsisted almost solely on grain and legumes for thousands upon thousands of years. I make organic popcorn (Trader Joes $1.99) cooked in organic olive oil (Costco) and I add organic melted butter (Costco or Trader Joes) and top with seasalt...share it with friends. Popcorn indeed is a healthy snack, but DIY. My favourite recipe is organic popcorn(black pearl) with olive oil or sprinkle some curry powder or dried herbals from my garden. Simple & delicious. Popcorn-a health food??? YES!!! I'm loading up next time at the movie theater!!! I only eat free-range, fair trade, organic, multi-colored, locally grown, popcorn popped in a solar popper. of roundup weed killer that is now actually a component of the corn kernels and soy beans. If it wasn't for weed killer, we'd have more starving people than we already do. Well, not you, obviously. They also don't mention that over 90% of corn produced in the US is GMO. I grew up on a farm and corn was used to fatten up the steers for market. Just think about it. Very nice post. I just stumbled upon your blog and wished to say that I've truly enjoyed surfing around your weblog posts. In any case I will be subscribing to your rss feed and I am hoping you write once more very soon! created some nice procedures and we are looking too trqde strategies with other folks, please shoot me an email if interested. The Viking Age was around the 8th ’til the 12th century. We are now in the 21st century, so it ended almost a thousand years ago!